As usual we went by train to Copenhagen that astonishingly enough drove straight onto a ferry to be transported to Denmark from Germany. Really cool to get off your train and step onto a ferry and walk up to the deck. Cruising into Denmark we were amazed to see the amount of wind turbines that were visible. We were surprised again at the kindness of strangers as we arrived in Copenhagen as guests of a local called Gitte who we met in Mt Fuji, Japan. We stayed at her place and she even made me some gluten free bread to take on my travels (it lasted until Norway). As usual we picked her brain for some travel information and again changed our plans to dump a place (I won't say where in case of offence) and instead decided to go to Bodo in Norway for an extended stay later on. Bodo is quite high up Norway and the train there goes right up the west side through all those famous fjords you hear about. We spent our first day in Copenhagen resting, washing clothes, shopping etc. Domestic days like that are really rare when travelling extensively like we are, it's all go go go without even a weekend off and as for clothes, well, if you both smell then you don't smell each other. Our visits in Copenhagen included the free walking tour that we have become fond of in Europe, a lot of the major European cities have them and it is a good way to explore the heart of the city with a large dose of history and humour at a really good price (although tips are encouraged)! We also took a harbour cruise of the city that gets you to areas you don't see just by walking. There are canals snaking all around the city but without the peeling onion shape of the canals of Amsterdam. In the evening Gitte took us out for a traditional Danish (comes with chocolate covered whipped egg white) icecream near the cruise ships and we went to see the little mermaid in the land of Hans Christian Andersen. The next day we went to the small seaside village of Dragor. This little town has lovely old buildings, a lot of them still with thatched roofs and beautiful gardens for a relaxing walk around. 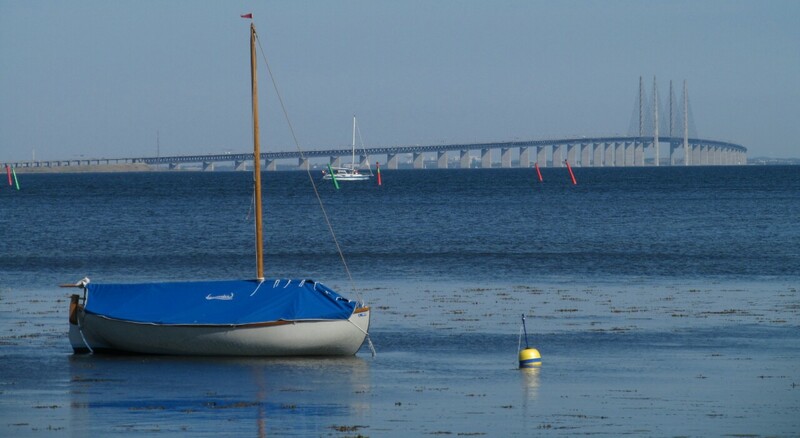 From here you can see Sweden and the bridge that links the two countries together. The day after that we had a sudden departure from our current form of travel and after 2 months had to take a plane to Iceland. Unfortunately trains don't go there. We stayed in the capital Reykjavik even though I wanted to get out into the middle somewhere. I had emailed a few places to try to find somewhere to stay and transport information but nobody replied. Unfortunately most of the really good scenic places to visit are a day trip or more away from the capital and they do not have much of a transport system so the best thing to do if you come here is hire a car. We didn't realise that in time and had not allotted enough time anyway but we did do a day trip by coach to the golden circle. A round trip that takes in the major sites only several hours away from the capital. Best part of the tour for us were the magnificent waterfall of Gullfoss and the incredible geyser and bubbling pools at Geysir. I will upload a film below of an eruption, be patient as it is about 20 seconds in. I filmed continuously at 30 second intervals to get it so as not to have dead space too long. Awesome to realise that it does that every day all day at about 2 to 6 minute intervals. We also saw the Nesjavellir geothermal power plant as Iceland meets 100% of its power needs from a combination of hydro and geothermal energy, even most of the hot water comes direct from hot thermal springs and their cold water comes from glaciers. Pretty weird that their cold water is world class, better than bottled water while you are told not to drink the slightly sulphurous smelling hot water. On our return trip we travelled on WOW airlines. They have a slightly different way of saying the safety talk than most, what follows was what was said as best as I can remember it. 'If an accident occurs an air mask will magically appear, at that point stop screaming and put the mask on' and 'under your seat you will find a beautiful yellow life vest...it comes with a light to make you look super cool and I hope it matches your shoes'. Iceland has a few really common sense laws, for instance embarrassing names are not allowed, if the name is not on the registry you have to make an application. It can be rejected on the grounds 'a forename may not be such as to cause its bearer embarrassment', all those Hollywood stars would fail. Iceland may need more investigation in the future, especially as it has one of the largest glaciers, but with a lot more time and a hire car. Ping-Valley where Iceland is ripping itself apart at the rate of 5cm per year. On the left is the American plate and on the right the European plate.